And the winner of the Essie nail polish giveaway is Tesla! Congratulations, Tesla! Thank you all so much for commenting! We will definitely be doing more giveaways so everyone could have a chance to win something at some point. Tesla, please email us at lhirondellerouge@gmail.com with your address and Chelle will ship your nail polish out to you this week! 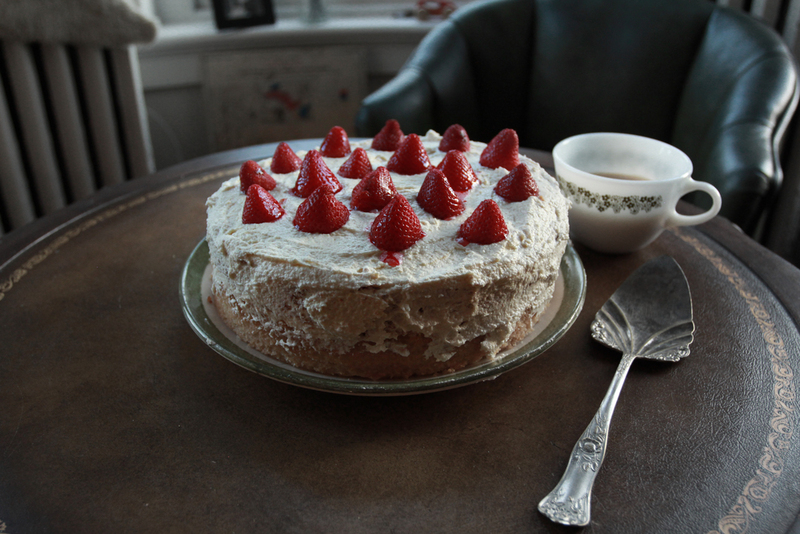 1. my very terrible yet beautiful cake... it was truly horrible tasting. I think Jesse was just going to power through and finish it but he seemed relieved to notice I wasn't finishing my slice. Not all pinterest recipes are good, folks! 2. scone and sun tea morning. The scones are always good. I should have stuck with what works and not wasted my expensive shortening on that cake! 3. been very tired lately and not feeling so great due to celiac and stuff. 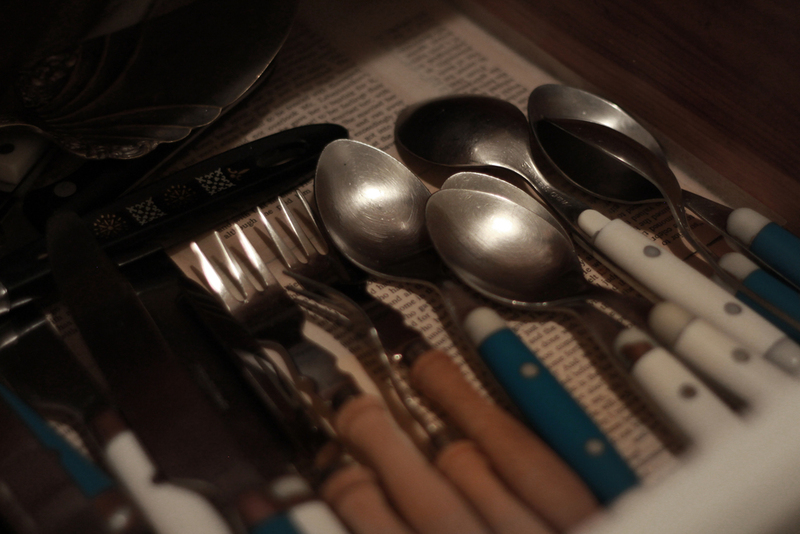 4. my beautiful cutlery drawer lined with an extra copy of Crime and Punishment. Which I read this summer... I thought I could save space and only bring one huge book but it's not as huge as I was hoping and I finished it within a week or two. Thankfully, there was an English bookstore in Rome. Speaking of books, Fall is a good time to pick up a new one or two or ten. Jesse and I just walked over to our local bookstore and got an old copy of The Little Prince because it is one of Jesse's favorites and (not sure how I missed this as a French major...) I have never read it! So now he is reading it aloud to me every evening while I cook dinner. It's probably going to become a new tradition. Random Harvest by James Hilton, Hilton is one of those solid British writers that you can count on for an adventure story that will captivate your entire brain and not let you stop thinking about it till it's finished. Trust me, you will find yourself inventing reasons to stay home and if you can't think of one you may contemplate reading while driving (I've done it and I'm still alive...) just so you can finish it. Take a bus. The Second Coming by Walker Percy, Jesse got me this book a while back because he told me the girl reminded him of me... she's crazy, lives in an abandoned greenhouse and builds a wood stove from scratch. He was spot on. Pastoral by Nevil Shute, Shute is another of those brilliant English authors who writes about everything I love (England, sailing, flying, Puget Sound, Australia, World War II, etc.). But this particular one is a slow moving romance... and not at all trashy. If you, like most people right now, are smitten with Downton Abby and Call the Midwife, then you should really read this. It's a very quick read. Certain Woman by Madeleine L'Engle, she always makes me want to move to New York City with her adult novels and this one is no exception... but it also is set on a boat on Puget Sound! So it's very homey as well. And, like all of her books, wonderfully and lyrically bewitching. Tender is the Night by F. Scott Fitzgerald, my favorite Fitzgerald book by a long shot because it seems the most human to me (although The Beautiful and the Damned is a close and rather depressing second). Honestly, I'm having trouble remembering details about it, which is always exciting because that means I can re-read it! Anna Karenina by Leo Tolstoy, I've been on a Russian literature kick lately, in part because they are so long. I'm a very fast reader, so it's really nice not to have to think about what to read next for a while! This starts pretty depressing, but it's worth pushing through... plus the descriptions of the clothes alone make it worth the read! An Everlasting Meal by Tamar Adler, every aspiring cook or anyone with access to a kitchen should read, own and keep this book. It is the single best cookbook I have ever read and it's not even a cook book. With chapter titles like, "how to boil an egg," Adler takes you back to the basics and gives you new appreciation for the simplest of meals, like scrambled eggs with herbs. Or a pot of beans. She says brilliant stuff like balance each day instead of each meal (if you had fruit for breakfast it's totally fine to have a cheese sandwich for lunch... you already had your fresh stuff!). Kinfolk, obviously... everyone should be reading this. And you already know it. What is on your nightstand or bookshelf for fall? Do you have any fun reading traditions or will you start one this fall? Where's your favorite place to read? Are you a bed reader or an overstuffed armchair reader or a coffee shop reader? Maybe you are a park bench reader... That's one I want to become more of. I'm mostly just a bed reader but we are hoping to get a big sheepskin and a pile of pillows for under our loft so maybe this fall I'll become a floor reader.